The K?k?riki or New Zealand parakeets are parakeets in the genus Cyanoramphus, family Psittacidae. Their M?ori name "K?k?riki" (translated "green") refers to their mostly green plumage. These brightly colored parakeets are found on many island groups in the South Pacific region. Sadly, these birds have suffered badly from habitat loss, alien (introduced) predators and possibly also exotic diseases. 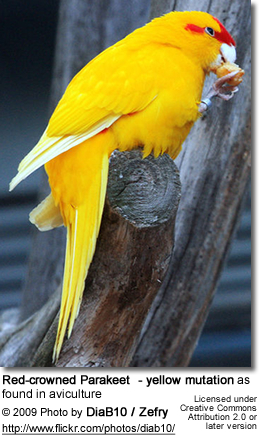 the critically endangered Malherbe's Parakeet (or Orange-fronted Parakeet ) C. malherbi. All above subspecies are native to New Zealand, and have become endangered as a result of habitat destruction following European settlement and nest predation by introduced species of mammal. Scarce on the mainland, k?k?riki have survived well on outlying islands, and also through breeding in captivity since they make good pets. A license from the New Zealand Department of Conservation is now required to breed them in captivity. 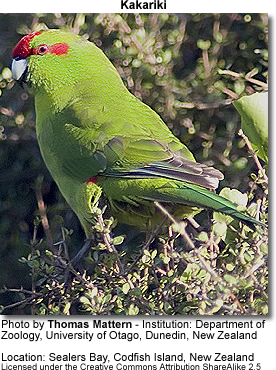 In October 2004, according to the Porirua City News (17 November, page 8), two pairs of Red-crowned Parakeets were seen in the Porirua Scenic Reserve, probably having flown from Kapiti Island. Mitochondrial DNA analysis has indicated that the Malherbe's or Orange-fronted Parakeet is a separate species and not just a color variation of the Yellow-crowned Parakeet. 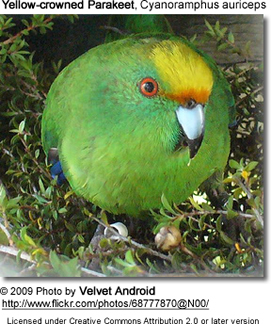 The Orange-fronted Parakeet is highly endangered, with less than 200 individuals remaining in the North Canterbury region of the South Island. Furthermore, Chatham Island's Yellow-crowned Parakeet and the red-crowned populations of New Caledonia, Norfolk Island and the subantarctic islands have been determined to be distinct species (Boon et al., 2001). The red-crowned parakeets are common in aviculture and they are relatively easy to breed. They lay about 3 to 5 white eggs in a nesting box. A cinnamon color variety and a pied variety are available.